Notes: Leslie West had already been the force in Mountain (either his first solo record or the first Mountain release depending which source you reference), played with his trio West, Bruce and Laing and now he wades into solo territory. Some nice material here and this record contains one of the best versions of the Tim Hardin song "If I Were A Carpenter". 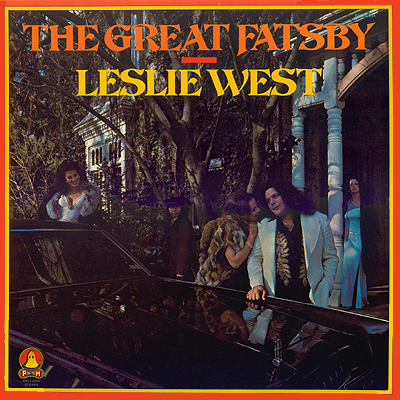 The strength and emotion in Leslie's voice picks you up and sweeps you along. I graduated high school the year this LP was released and distinctly remember dringing beer in the park with my friends and playing this album over and over (loudly singing along much to everyone's chagrin). Leslie's guitar is surrounded with a band which includes names such as Jagger, Laing and Wright. I guess the take-away from this record is that it's about the song and not the scales and solos. 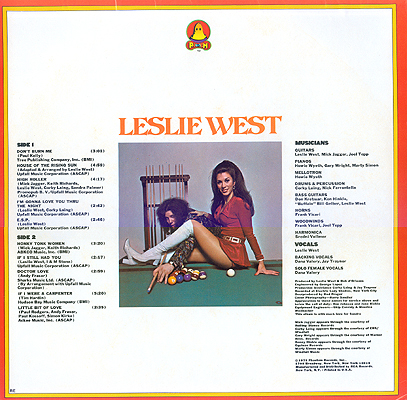 Front and back covers show Leslie living the life in all its finery.